Here at Yarwoods Excavator Attachment Ltd we provide waste grab hire in Newcastle and throughout the UK. 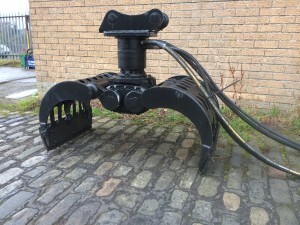 For all of your waste grab hire in Newcastle, Yarwoods Excavator Attachments Ltd have a full range of Kinshofer and Demarec waste grabs available for hire to fit machines from 5 tons through to 70 tons. Waste grabs or sorting grabs are useful in all areas of construction, demolition, waste handling and recycling. They can be classed as the most efficient way to sort materials on site. A waste grab hire from Yarwoods is easy as we have a selection of top brackets to fit most machines. Our Kinshofer and Demarec waste grab selection all have heavy duty perforated shells which let fine dust & gravel through without large pieces getting caught. The Kinshofer’s waste grab hire range will fit machines with operating weights from 1 ton through to 27 tons. They are available with perforated shells or ribs, whilst the Heavy Duty Demarec range fits machines with operating weights from 10 tons through to 70 tons. These are built as standard with heavy duty perforated shells. The waste grab hire selection are ideal for sorting different materials. Replaceable and reversible cutting edges are made from 500 Brinel steel ensure long life. They have exceptional closing forces through two horizontally positioned hydraulic cylinders that are protected by the bucket carrier, whilst the cylinders are hydraulically cushioned to increase service life. Popular models are normally in stock at Yarwoods. We provide waste grab hire throughout Scotland, North West, North East and the UK as a whole, including Newcastle, Glasgow, Edinburgh, Lanarkshire, Inverness, Yorkshire and Carlisle and many more. Click here to find out more about hire at Yarwoods.